Joshua Michael Sterns’ Jobs, which opens today in theaters, is the first of two Steve Jobs biopics after the passing of the late Apple cofounder in October of 2011. With Ashton Kutcher, of That 70’s Show and Dude, Where’s My Car? fame as the titular character, and mixed reception after its debut at the Sundance Film Festival, my expectations for the film were, well, low. The good news: Jobs isn’t terrible–far from it. Rather, it’s a much more decidedly mediocre, big-picture look at the historically significant events in Steve Jobs’ life. According to Steve Wozniak, the character of Jobs and the events of the film aren’t 100 percent accurate (“One friend who is in the movie said he didn’t want to watch fiction so he wasn’t interested in seeing it”), but as a Hollywood interpretation of events, it makes for decent enough entertainment. It’s got some chuckles, some tension, and solid acting in its favor. It also has all the nuance and deft character development of a third-grade play, repeatedly spoonfeeding you its relevant themes and plot points (“I guess I just can’t work for other people,” Kutcher’s character says early on in the film, successfully indicating that Jobs just couldn’t work for other people). And because it’s determined to take you whirlwind tour of the entirety of Jobs’ very eventful life in only 125 minutes, the story moves so fast that you never end up developing a meaningful connection with any of its core characters. After opening with Kutcher’s Steve Jobs introducing the revolutionary iPod music player at a 2001 Apple Town Hall meeting, the film leaps back in time to a college-age Jobs at Reed College in 1974 and proceeds chronologically through the major stepping stones of his life: working at Atari, forming Apple and building the Apple I, his tumultuous relationship with Chris-Ann Brennan, the Lisa versus Macintosh saga, hiring John Sculley as Apple CEO, and his unceremonious ouster from the company he helped create. It closes with Jobs recording the voiceover for the 1997 “Crazy Ones” television spot from Apple’s Think Different advertising campaign (in reality, this was voiced by Richard Dreyfuss, but that would make for a far less inspirational closing scene). Kutcher does a respectable job of channeling the former Apple CEO, particularly as the late ’90s, return to Apple-era Jobs; the raging, employee-firing Jobs; and the confident, charismatic Jobs persona we encountered at Apple media events. Kutcher’s portrayal of the younger, collegiate Jobs felt less sincere than older versions, however, perhaps because there was less video footage to emulate. The character of Jobs evolves through the film from overconfident, emotional, and self-serving in his younger days to a more grounded, family-focused, and business-savvy adult, though some of the things we see Jobs do in the process are abhorrent and shocking, like kicking out his girlfriend after she reveals she’s pregnant and firing an employee on the spot in a storm of rage. There are more human moments as well, like his emotional breakdown after being removed from Apple’s leadership team, or having breakfast with his family in the days before NeXT was folded into Apple. Still, rather than empathize with Jobs, I felt more like an outsider, simply watching the film run down a extensive checklist of important biographical events. The closest I felt to an emotional connection was when Wozniak (Josh Gad) explains to Jobs why he’s leaving Apple, although his monologue falls prey to the movie’s consistent impulse to directly state character and plot developments that should be readily observable. After all, why show when you can show and tell? If you’re looking for speedy overview of Apple history in a moderately entertaining two-hour package with some bonus ’70s and ’80s nostalgia, the film delivers. It isn’t an intellectual or particularly artistic film that addresses the how or why of the Apple co-founder’s life, and it doesn’t leave you inspired (although it certainly tries). 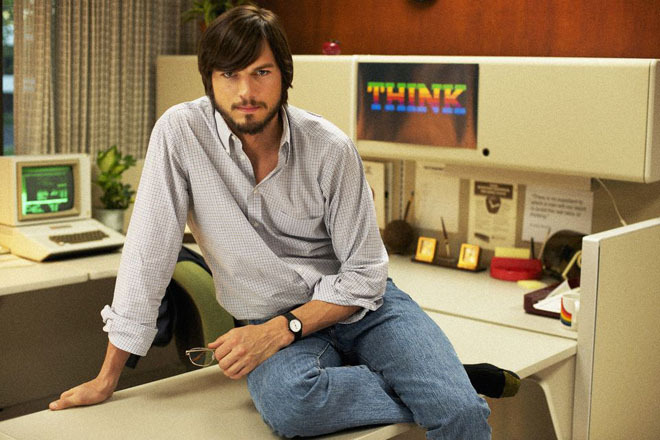 If that’s what you want out of a Steve Jobs biopic, perhaps you should wait for Aaron Sorkin’s take on Jobs to hit theaters in 2014. But if you don’t mind “Steve Jobs for Dummies,” Jobs has got you covered.